Residents within the Miller Creek Watershed are working together toward clean water. Help us improve the water quality in our community. A watershed is an area of land, often neighborhoods comprised of fields, farms, towns, streams and lakes, that all drain to a common point. Every watershed is unique. The Miller Creek Watershed is primarily an agricultural watershed. It covers more than 42,000 acres and includes 135 farmer producers and 230 landowners within its boundaries. Watershed communities like Miller Creek are working together to improve water quality, build soil health, and reduce flood risk. The watershed approach to improving water quality encourages all stakeholders in the area to work together toward a future that strengthens the community and promotes agriculture. Together, the community of stakeholders is assessing current conditions, identifying challenges and opportunities and charting a path forward. 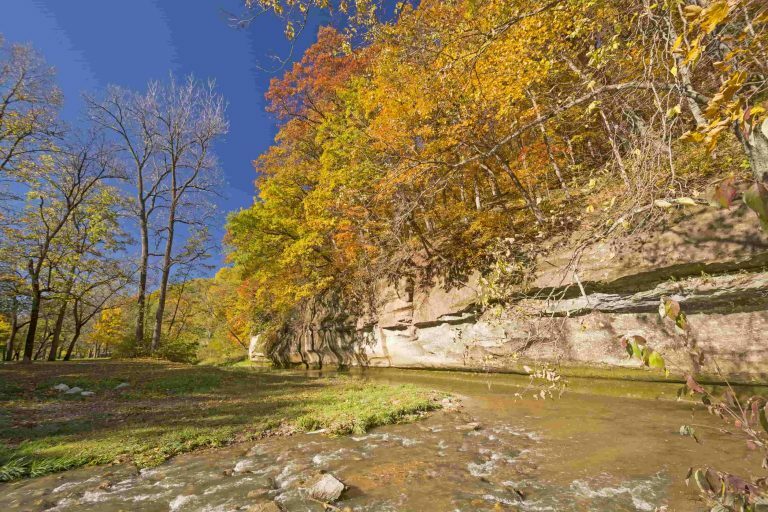 Why Does the Miller Creek Watershed Need Our Help? Farmers in the Miller Creek Watershed are actively implementing conservation practices to improve water quality. In fact, there’s been such a demand for conservation practices that in 2017, the project ran out of funding for these practices. Continued growth of conservation practices is anticipated over the next several years and will require increased funding. What is the Iowa Nutrient Reduction Strategy? Water quality has been a topic of conversation and planning for several years now as states in the Mississippi River Basin work toward the goal of decreasing nutrient runoff by 45 percent. A key to managing water quality is a watershed plan, developed by farmers and other stakeholders to link local needs and goals with the statewide Iowa Nutrient Reduction Strategy (NRS). Watershed plans developed at the local level allow the flexibility to install the practices that will be effective and fit the landscape of the local watershed. 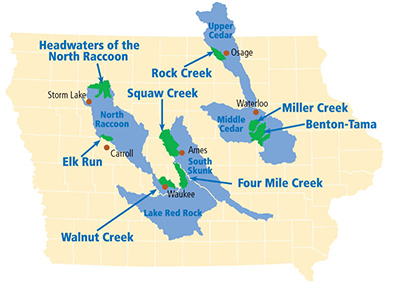 The Iowa Water Quality Initiative (WQI) is the action plan for the NRS. It is a comprehensive approach which allows farmers and cities alike to adopt conservation practices that fit their unique needs, lands, and budgets. Urban-rural partnerships are vital to implementing the NRS and making a positive impact on water quality. The Miller Creek Watershed project is one of the leading WQI nutrient reduction projects in the state. Local farmers are proactively improving water quality in the Miller Creek Watershed. There are five key water quality practices that farmers are implementing to help decrease nutrient losses and thereby limit nutrient runoff into waterways. They include planting cover crops, using no-till and strip-till practices to reduce soil erosion, installing bioreactors and saturated buffers to capture and breakdown nutrients, employing efficient nutrient management practices and re-establishing wetlands in critical areas. How Can I Help Improve Water Quality? Now’s your chance to make a difference in your community. Farmers are planting cover crops between harvests to improve water quality, but funding is not matching demand. 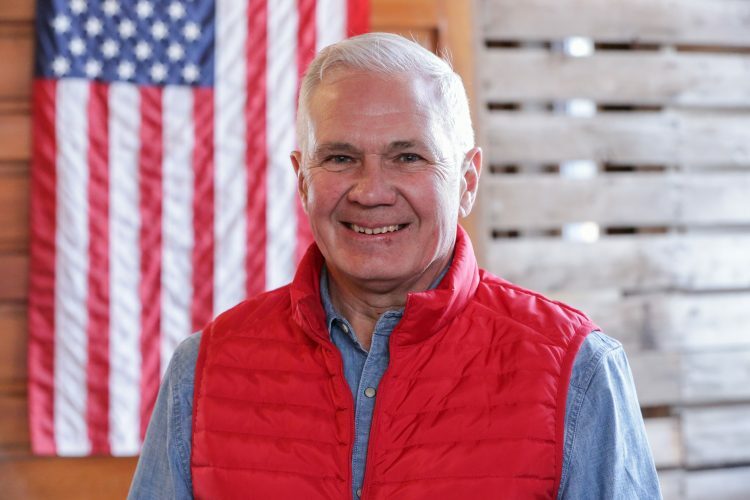 In fact, in the Miller Creek Watershed this year alone, there was a $27,000 deficit. By providing more dollars for watershed management practices at the local level, we’ll see more cover crops planted for better water in our community! Let’s work together to keep nutrients in the field, protect and conserve our natural resources, and improve environmental quality. Cover crops such as winter rye are planted in the fall before harvest or after row crops are harvested. They reduce the loss of nitrogen and phosphorus from the soil and capture nutrients for next year’s crop and keep them out of our water. As a significant component of the Iowa NRS, cover crops provide immediate and long-term benefits for water quality and soil health. They have been documented to reduce nitrate concentrations by an average of 30 percent. Conservation drainage is an emerging set of practices designed to maintain drainage benefits while addressing water quality and flow impacts. Examples of these practices include controlled drainage (drainage water management) and edge-of-field practices such as bioreactors, saturated buffers, and treatment wetlands. Improving water by providing targeted resources where they can make the biggest impact is the kind of innovative approach Iowans demand. The Miller Creek Watershed is focused on reducing nutrients, in particular, nitrogen and phosphorous. More conservation practices are being put on the land that reduce erosion, reduce tillage, and improve water quality. 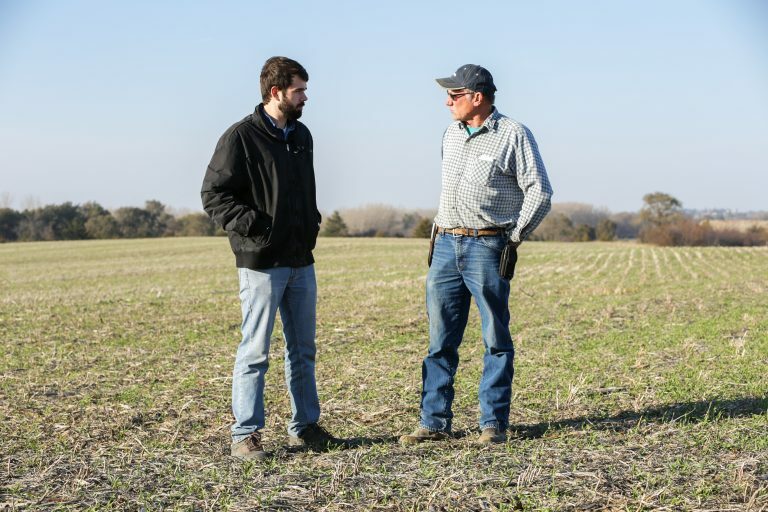 Within the Miller Creek Watershed, farmers are implementing conservation practices such as cover crops and nutrient management practices to improve water quality. In fact, 16 percent of the watershed’s acres are in cover crops. This is significantly higher than the statewide average. This increased demand has outpaced current funding, so we’re reaching out to the community. Water quality impacts all of us, and now you have the chance to make a difference. While there is a current deficit of $27,000 to help farmers cover more acres with cover crops, demand continues to grow. Our overall goal is to raise $100,000 to support additional conservation activities over the next three years. How Can I Donate to Improve Our Water? Click on the “Donate” link that appears on this page and pay online through PayPal. If you don’t have a PayPal account, you can create a new account before you pay. If you don’t want to create an account, you can pay using a credit or debit card.